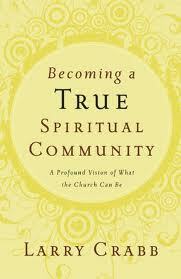 A friend alerted me to a book by the well know Christian author Larry Crabb: Becoming a True Spiritual Community- A Profound Vision of What the Church Can Be. And I’m disappointed, overwhelmingly so, when I take stock of the current state of Christian community. In my own life, there are several bright pockets of relational joy, for which I am extremely grateful, but none that quite measure up to Trinitarian standards. And he continues by declaring. I am willing to risk giving up my cultural definition of church and try to define it biblically. When I read this I knew someone else understood my plight. My desire for something more profound wasn’t just an idle and foolish wish. More over it reminded me how profound our revisioning of the church needs to be. Larry Crabb’s offering adds to the other excellent work being done by people such as Michael Frost (Exiles) and Tim Chester and Steve Timmis (Everyday Church). Crabb’s book takes us deeper into the heart of the Christian community. He looks at what stifles spiritual community and suggests ways in which it can be/must be enhanced. It is dangerous using a phrase like “Spiritual Community” because we all have our own understanding of it – usually shaped by our experiences. Larry Crabb speaks of “turning our souls towards one another”. He references people such as Henri Nouwen, Teresa of Avila and Dietrich Bonhoffer – who all take us beyond institution to a perspective that is far more intimate and relational with God and each other. This book also challenges many of the attitudes and values of counselling and therapy and explores how our healing/restoration will be far more effective if, in community, we point each other towards God, and if we see suffering as a means of drawing closer to Him. This is a book I haven’t finished yet, and I already know I will have to re-read. What it is calling for is a paradigm shift in the way we “do” church. I hope to say more about this book and its impact in future posts. So glad this book is blessing you and thanks for blogging about it! Crabb gives a LOT to reflect on and I look forward to reading more from you in the future! It is very unsettling – in the best possible way. What a great way to put it! After reading the one you quoted from I began “Shattered Dreams” and have two more of his I want to read before the last week in September when I get to participate in a week-long School of Spiritual Direction with Dr Crabb. Am very much looking forward to it!